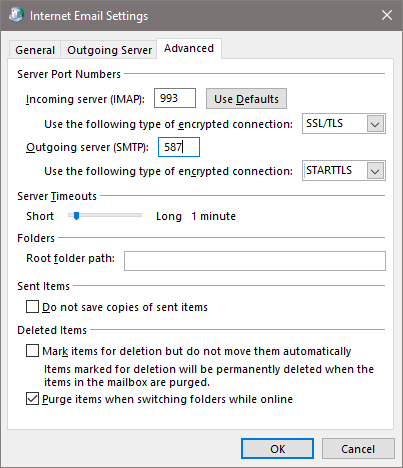 Office 365 allows you to send email via SMTP based on user authentication. This is commonly used in conjunction with POP or IMAP clients. Where POP or IMAP is used for reading messages and SMTP is used to send the messages. This might also be used by applications and multi-function devices that need to send email. If you select the wrong encryption type then Outlook will fail to authenticate. 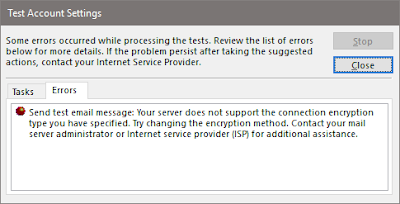 For example, if you select the encryption type as SSL/TLS You get the following error which indicates: "Your server does not support the connection encryption type you have specified." It's pretty rare to run into this error because most of the time, you'll be using autodiscover to configure Outlook and use the web-based protocols. However, you might run into this if you're testing to verify that an account is working properly as part of troubleshooting an app or multi-function device. A consultant, author, and instructor for about 20 years. My areas of expertise are Windows Server, Exchange Server, and Office 365. While my primary role is a consultant, I also provide technical training (custom and Microsoft authorized). I have been part of a team authoring Microsoft Official Curriculum on Windows Server, Active Directory, and Exchange Server since 2003. I have also authored books for Microsoft Press, Cengage Learning, and Wiley. I was also a Microsoft MVP for Exchange Server/Office 365 (2012-2015).